Getting ready to run out the door…. 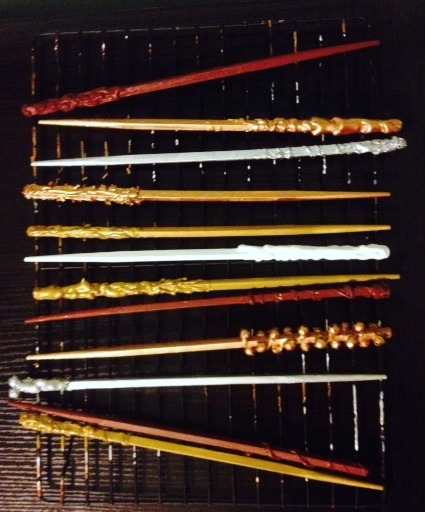 …with a fresh batch of magic wands! …to go with my new living room furniture. I have to share it because not only did I come across completely by luck, when I was shopping for something else entirely, but I got a fantastic deal, too. I was at Bed Bath and Beyond getting some things for the house, and I had already paid when I spotted this picture near the door. It was marked at $49.99, and I decided to think about it for a bit. I am trying not to rush into so many expenditures. I decided it was so perfect, though that I had to go back and get it. When I did, it rang up at $12.49! What a deal! So, I had to share. This was the first piece of furniture that I bought brand new because it was exactly what I wanted. Of course I had to get something stylish and comfy to sit in while reading. Next to it is my shelf of science fiction, which only has space available momentarily, until I get my books out of the closet, and read a few more from the TBR shelves. Didn’t I tell you they are beautiful? Special guest appearance by the edge of my new living room couch. This was taken not too long after I got the shelves; there are more books on there now, although I am trying to leave some decorative space on these shelves. Every time I get a new set of shelves, I realize I need at least one more set. I got a Blackberry! It is so much fun figuring out what I can do with it, although it is cutting into my reading time. I surfed the web and read email and texted my friend Bambi on the train this morning, which is usually prime reading time. I imagine this will die down after I get more used to this, though. In the meantime, I am having a blast! Here is picture of the view from my desk at work.